Coaticook Ice Cream is a fairly recent discovery for me. It's a local dairy company (2 hour drive outside of Montreal) that makes a variety of products, but the focus here is on their ice cream. I've never given their ice cream much notice before in the grocery store aisle. On the surface it looks a lot like your "no name" ice cream brands. It just looks a lot like any other plastic two liter tub of ice cream. No fancy full color photos of ice cream, only a Coaticook logo printed on a transparent tub that showcases the ice cream that you will actually get. You'll notice right away that they do ice cream the "old fashioned" way: milk, cream and sugar as the primary ingredients in their ice cream. Additionally, Coaticook uses 100% Quebec milk and no modified milk ingredients. Modified milk ingredients also called natural milk constituents are umbrella terms for a group of milk products which have an altered chemical state from that which is naturally found in milk. You can taste the difference. Taste-wise I find it to be a lot lighter than other lesser ice cream brands (ones that use modified milk ingredients). It's not nearly as heavy; you almost feel like you can virtually eat the whole tub yourself. It's great quality ice cream, and the price is also very reasonable at $5; a great alternative to the $8 premium ice cream brands that we have here in Montreal. Side note: My favorite flavors right now are Chocolate and Maple Sugar. And although I am a huge cheesecake fan, the Cherry Cheesecake ice cream just wasn't a hit for me. Double Chocolate is next on my "to eat" list. Your turn now...What is your favorite Coaticook ice cream flavour? Update: I've probably eaten by now a dozen Maple Sugar tubs of Coaticook ice cream. It's just so sweet and tasty (the maple crunch bits are amazing), that I don't even want to try any other flavours. I'm definitely not tired of eating it...I'm now working on the next dozen tubs haha. tried this. pretty good. HUGE JAR of icecream for 5$. what a steal. Yup, agreed. It's really nice to have a quality product that is fairly priced. No need to wait for "specials" each week. 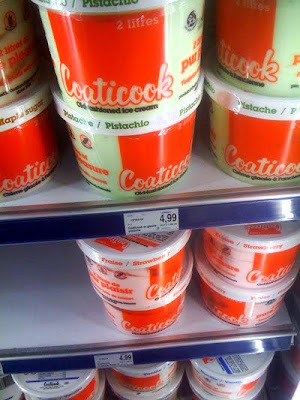 Just walk in a grocery store and pick up a nice tub of tasty ice cream whenever you want.